If you’re going to make a subgroup called the Crimson Strike Team, tapping Tomax and Xamot for inclusion in the team is a no-brainer. 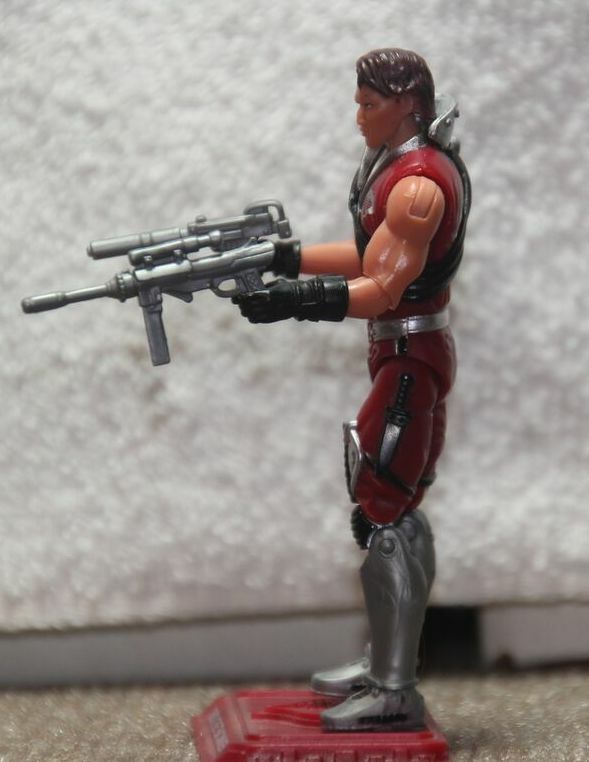 The GIJCC did that with their first iteration of the Crimson Strike Team and it makes perfect sense for them to do it with the modern versions. The Crimson Twins are always working their own angle. Why wouldn’t they want their own squad of Vipers loyal only to themselves? After all, the Crimson Guard were always said to be loyal only to Cobra Commander so if the Crimsons Twins wanted some muscle, they’d need to find some other group of Cobras to bring into their secretive schemes. 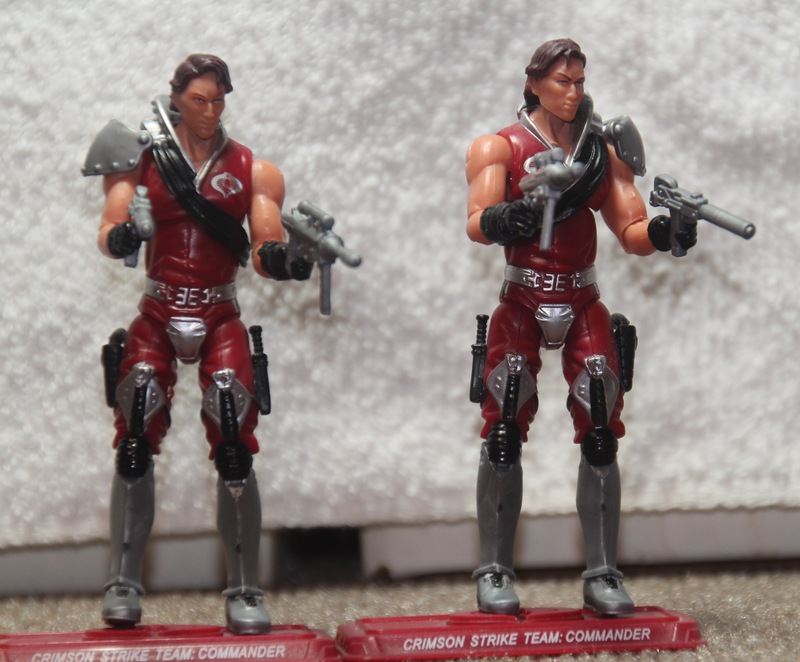 The Crimson Strike Team versions of Tomax and Xamot use the same molds as the standard releases. Their gear is slightly more circus than terrorist but that works considering their cover is being part of the Arbco Brothers’ Circus. Even though the molds have started to look a little dated, I’m still impressed at how detailed Tomax and Xamot are. The tall boots look great and the Cobra thigh pads are impressively well-detailed. I’m still not sure what I think of the armored codpiece, but I suppose if I had a twin whose pain I felt, I’d probably want to make sure neither of us took a shot to the nuts. The belts look great and the “EE” buckle is a nice reference to the twins’ role as CEOs of Extensive Enterprises. Tomax and Xamot benefited from having probably the best set of bare arms for quite a while. They look appropriately muscular and their anatomy is natural. Parts of me think it might have been better if the arms were a little thinner since the twins are acrobats. Yes, acrobats are strong, but they’re also usually relatively lithe and these arms seem just a little too big. So they didn’t have to mold two torsos for the Crimson Twins, Hasbro created a twins-specific torso that was generic enough to work for both of them. 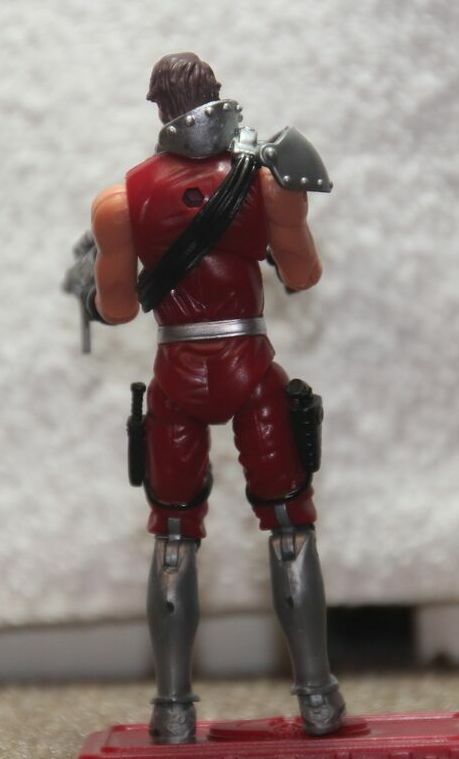 The sash and shoulder pad are added on pieces since it was more cost effective to design unique add ons than it would be to create two torsos with very little reuse potential just for Tomax and Xamot. The sash and shoulder pad combination is good, though I do have to criticize the GIJCC for how they handled packagaing the figures. Xamot’s shoulder pad doesn’t attach at all securely to the figure. I think part of it is a molding flaw but part of it comes from the fact that the shoulder pad didn’t fit into the little cut out for the figure in the box so the GIJCC packaged them as separate pieces. I’ve nearly lost that dumb shoulder pad quite a few times since I got this figure and I really wish there were a way to make it attach more securely. Up top, Tomax and Xamot have the same heads they got in their standard versions. It’s a nicely designed piece and the scar on Xamot’s face adds just a little more character and I like that. They both have rather angular features, which helps make them look a little more like bad guys, but they’re also still very attractive men. These guys wouldn’t look out of place in a brokerage house like Wolf of Wall Street and they definitely have a sleazy 80s vibe that makes me want to dislike them even more. When you’re part of a set called the Crimson Strike Team, it’s pretty obvious what colors are going to be used extensively. The body suit is red while the metal detailing are silver with some black used on the trim and the sash. It’s a very striking look and while I’d prefer it if the red were a few shades darker, it still looks very good. Like the rest of the members of the Crimson Strike Team, Tomax and Xamot have apparently spent quite a bit of time tanning because they’re skin is much ruddier than the last time we saw them. For Tomax and Xamot, it actually kind of works because I thought the first figures were a bit on the pale side. However, it does make it harder to notice Xamot’s scar at a quick glance. The paint work on the chest is a little sloppy. There’s quite a bit of silver bleed on both Tomax and Xamot’s chests. Considering how well-applied the silver was on the piping on the Baroness’ bodysuit, it surprises me that the silver on Tomax and Xamot’s collars is so sloppy. 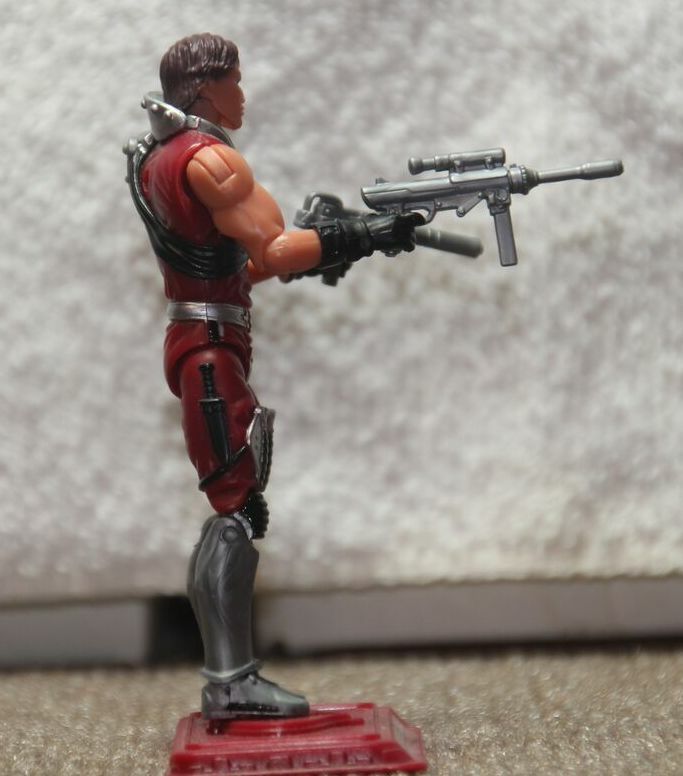 Despite the paint slop, these are striking figures and Tomax and Xamot still look good in red and silver. 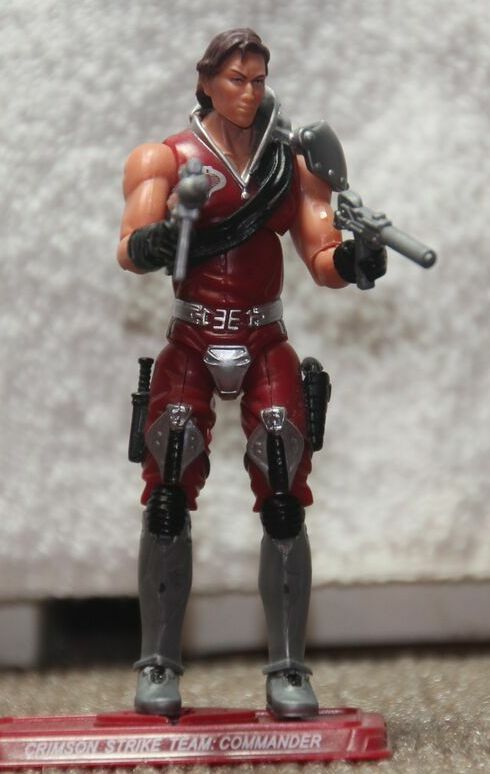 Like the other figures in the Crimson Strike Team set, Tomax and Xamot each come with one weapon they originally had and another weapon that they didn’t have before. 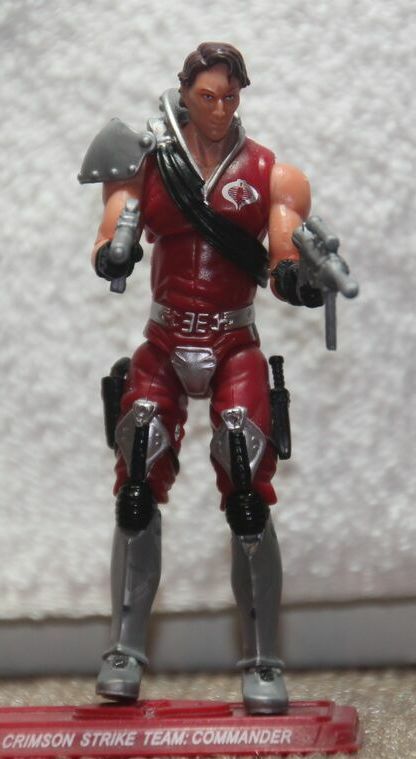 Tomax and Xamot both come with the same weapons. 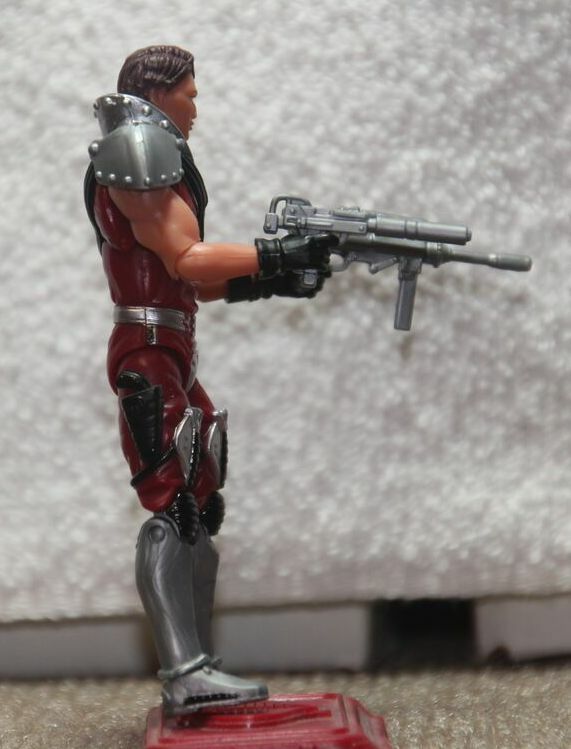 The first one is the weapon they got when they were released in comic pack form, the cartoon-inspired Cobra laser pistol. I really do like this weapon and it reminds me of the overexposed vintage Crimson Twin pistol. However, since it’s designed differently and can actually be held by figures, I don’t hate it nearly as much. It’s a great piece and a nice nod to the Joe brand’s cartoon history. Their other weapon is the same silenced submachine gun we first got with 25th Anniversary Mutt. As much as I like the modern cartoon pistol, I like the silenced submachine gun even more. It’s a great, compact piece and is something that’s fairly easily concealable. I can see that being something Tomax and Xamot would appreciate since they could keep a weapon on them at all times without risking someone noticing it. These two weapons work very well together and Tomax and Xamot look great holding them. Tomax and Xamot were completely unchanged from their original Hasbro releases, so at their core, they’re repaints of something I already have, but I don’t mind that for some reason. I think part of it is that ever since I learned about them in high school (I only have the vaguest recollections of the Sunbow Joe cartoon so there are a lot of Joe characters I probably saw once or twice on the screen but don’t remember much about), I’ve been kind of fascinated with Tomax and Xamot. I like it when they show up in whatever form they do. Plus, despite the same bodies, the red, silver and black color scheme looks very different from their standard releases. I don’t mind straight up repaints if they do something very different with the figure. Yes, the silver paint work could be better, but still, it’s a sharp look and I like seeing the Crimson Twins in red. It’s just a good look for them. I’ll always prefer blue and silver for Tomax and Xamot, but these aren’t bad looking figures. 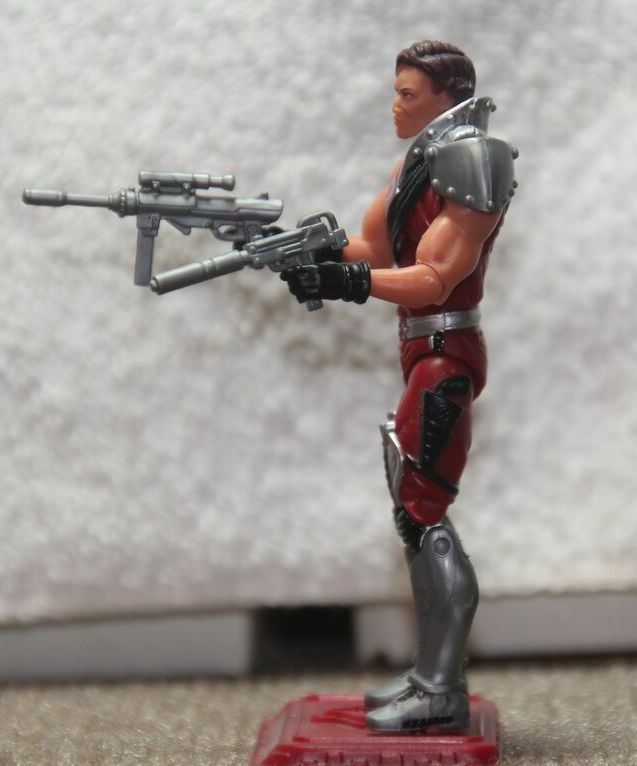 When Hasbro was releasing updated versions of older character for Battle Corps, I had hoped these guys would get released as I never had the originals.